"Donkey rhubarb" redirects here. For the EP by Aphex Twin, see Donkey Rhubarb (EP). Reynoutria japonica, synonyms Fallopia japonica and Polygonum cuspidatum, is a large species of herbaceous perennial plant of the knotweed and buckwheat family Polygonaceae. It is commonly known as Asian knotweed or Japanese knotweed. It is native to East Asia in Japan, China and Korea. In North America and Europe, the species has successfully established itself in numerous habitats and is classified as an invasive species in several countries. Japanese knotweed has hollow stems with distinct raised nodes that give it the appearance of bamboo, though it is not related. While stems may reach a maximum height of 3–4 m (9.8–13.1 ft) each growing season, it is typical to see much smaller plants in places where they sprout through cracks in the pavement or are repeatedly cut down. The leaves are broad oval with a truncated base, 7–14 cm (2.8–5.5 in) long and 5–12 cm (2.0–4.7 in) broad, with an entire margin. The flowers are small, cream or white, produced in erect racemes 6–15 cm (2.4–5.9 in) long in late summer and early autumn. Related species include giant knotweed (Reynoutria sachalinensis, syns. Fallopia sachalinensis, Polygonum sachalinense) and Russian vine (Fallopia baldschuanica, Polygonum baldschuanicum). 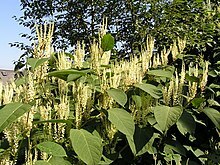 Other English names for Japanese knotweed include fleeceflower, Himalayan fleece vine, monkeyweed, monkey fungus, Hancock's curse, elephant ears, pea shooters, donkey rhubarb, sally rhubarb, Japanese bamboo, American bamboo, and Mexican bamboo. In Chinese medicine, it is known as huzhang (Chinese: 虎杖; pinyin: hǔzhàng), which translates to "tiger stick". There are also regional names, and it is sometimes confused with sorrel. In Japanese, the name is itadori (虎杖, イタドリ). Dead stems from previous years remain in place as new growth appears. Japanese knotweed flowers are valued by some beekeepers as an important source of nectar for honeybees, at a time of year when little else is flowering. Japanese knotweed yields a monofloral honey, usually called bamboo honey by northeastern U.S. beekeepers, like a mild-flavoured version of buckwheat honey (a related plant also in the Polygonaceae). The young stems are edible as a spring vegetable, with a flavour similar to extremely sour rhubarb. In some locations, semi-cultivating Japanese knotweed for food has been used as a means of controlling knotweed populations that invade sensitive wetland areas and drive out the native vegetation. It is eaten in Japan as sansai or wild foraged vegetable. It is used in traditional Chinese and Japanese medicine to treat various disorders through the actions of resveratrol, although there is no high-quality evidence from clinical research for any medical efficacy. Extracts of resveratrol from R. japonica roots are higher in content than those from stems or leaves, and have highest levels at the end of the growing season. This antique locomotive at Beekbergen, Netherlands, is overgrown by knotweed. A few years before, it was free of knotweed. The plant is known as itadori (虎杖). The kanji expression is from the Chinese meaning "tiger stick". One interpretation of the Japanese name is that it comes from "remove pain" (alluding to its painkilling use), though there are other etymological explanations offered. It grows widely throughout Japan and is foraged as a wild edible vegetable (sansai), though not in sufficient quantities to be included in statistics. They are called by such regional names as tonkiba (Yamagata), itazuiko (Nagano, Mie), itazura (Gifu, Toyama, Nara, Wakayama, Kagawa), gonpachi (Shizuoka, Nara, Mie, Wakayama), sashi (Akita, Yamagata), jajappo (Shimane, Tottori, Okayama), sukanpo (many areas). Young leaves and shoots, which look like asparagus, are used. They are extremely sour; the fibrous outer skin must be peeled, soaked in water for half a day raw or after parboiling, before being cooked. Places in Shikoku such as central parts of Kagawa Prefecture pickle the peeled young shoots by weighting them down in salt mixed with 10% nigari (magnesium chloride). People in Kochi also rub these cleaned shoots with coarse salt-nigari blend. It is said (though no authority is cited) that the magnesium of the nigari binds with the oxalic acid thus mitigating its hazard. It is a frequent colonizer of temperate riparian ecosystems, roadsides and waste places. It forms thick, dense colonies that completely crowd out any other herbaceous species and is now considered one of the worst invasive exotics in parts of the eastern United States. The success of the species has been partially attributed to its tolerance of a very wide range of soil types, pH and salinity. Its rhizomes can survive temperatures of −35 °C (−31 °F) and can extend 7 metres (23 ft) horizontally and 3 metres (9.8 ft) deep, making removal by excavation extremely difficult. The plant is also resilient to cutting, vigorously resprouting from the roots. Identification of Japanese knotweed is not always easy. Many other plants are suspected of being knotweed, due often to the similar appearance of leaves and stems. Dogwood, lilac, Houttuynia (Houttuynia cordata), ornamental Bistorts such as Red Bistort (Persicaria amplexicaulis), lesser knotweed (Persicaria campanulata), Himalayan Balsam (Impatiens glandulifera), Broadleaved Dock (Rumex obtusifolius), Bindweed (Convolvulus arvensis), bamboo, Himalayan Honeysuckle (Leycesteria formosa), and Russian Vine (Fallopia baldschuanica) have been suspected of being Reynoutria japonica. New leaves of Reynoutria japonica are dark red and 1 to 4 cm (0.4 to 1.6 in) long; young leaves are green and rolled back with dark red veins; leaves are green and shaped like a heart flattened at the base, or a shield, and are usually around 12 cm (4.7 in) long. Mature R. japonica forms 2-to-3-metre (6.6 to 9.8 ft) tall dense thickets; stems look somewhat like bamboo, with rings and purple speckles. Leaves shoot from the stem nodes alternately in a zigzag pattern. Mature stems are hollow and not at all woody: they can be snapped easily to see if they are hollow. Plants that are immature or affected by mowing or other restrictions have much thinner and shorter stems than mature stands, and are not hollow. Japanese knotweed has a large underground network of roots (rhizomes). To eradicate the plant the roots need to be killed. All above-ground portions of the plant need to be controlled repeatedly for several years in order to weaken and kill the entire patch. Picking the right herbicide is essential, as it must travel through the plant and into the root system below. The abundance of the plant can be significantly reduced by applying glyphosate, imazapyr, a combination of both, or by cutting all visible stalks and filling the stems with glyphosate. However, these methods have not been proven to provide reliable long-term results in completely eliminating the treated population. Digging up the rhizomes is a common solution where the land is to be developed, as this is quicker than the use of herbicides, but safe disposal of the plant material without spreading it is difficult; knotweed is classed as controlled waste in the UK, and disposal is regulated by law. Digging up the roots is also very labour-intensive and not always efficient. The roots can go to up to 10 feet (3.0 meters) deep, and leaving only a few inches of root behind will result in the plant quickly growing back. Covering the affected patch of ground with a non-translucent material can be an effective follow-up strategy. However, the trimmed stems of the plant can be razor sharp and are able to pierce through most materials. Covering with non-flexible materials such as concrete slabs has to be done meticulously and without leaving even the smallest splits. The slightest opening can be enough for the plant to grow back. More ecologically-friendly means are being tested as an alternative to chemical treatments. Soil steam sterilization involves injecting steam into contaminated soil in order to kill subterranean plant parts. Research has also been carried out on Mycosphaerella leafspot fungus, which devastates knotweed in its native Japan. This research has been relatively slow due to the complex life cycle of the fungus. Two biological pest control agents that show promise in the control of the plant are a leaf spot fungus from genus Mycosphaerella and the psyllid Aphalara itadori. Research has been carried out by not-for-profit inter-governmental organisation CABI in the UK. Following earlier studies imported Japanese knotweed psyllid insects (Aphalara itadori), whose only food source is Japanese knotweed, were released at a number of sites in Britain in a study running from 1 April 2010 to 31 March 2014. In 2012, results suggested that establishment and population growth were likely, after the insects overwintered successfully. Anecdotal reports of effective control describe the use of goats to eat the plant parts above ground followed by the use of pigs to root out and eat the underground parts of the plant. The most effective method of control is by herbicide application close to the flowering stage in late summer or autumn. In some cases, it is possible to eradicate Japanese knotweed in one growing season using only herbicides. Glyphosate is widely used as it is non-persistent, and certain formulations may be used in or near water. Trials in Haida Gwaii, British Columbia, using sea water sprayed on the foliage, have not demonstrated promising results. Japanese knotweed is classed as an unwanted organism in New Zealand and is established in some parts of the country. European adventurer Philipp Franz von Siebold transported Japanese knotweed from a Japanese volcano to Holland. By 1850 a specimen from this plant was added to the Royal Botanic Gardens, Kew. It was favoured by gardeners because it looked like bamboo and grew everywhere. Ann Conolly provided the first authoritative work on the history and distribution of the plant in the UK and Europe in the 1970s. According to The Daily Telegraph, the weed has travelled rapidly, aided by rail and water networks. In the UK Japanese knotweed is a single female clone. However, it is able to readily hybridise with related species. In the UK, Japanese knotweed is established in the wild in many parts of the country and creates problems due to the impact on biodiversity, flooding management and damage to property. It is an offence under section 14(2) of the Wildlife and Countryside Act 1981 to "plant or otherwise cause to grow in the wild" any plant listed in Schedule nine, Part II to the Act, which includes Japanese knotweed. Within towns householders and landlords in 2014 who did not control the plant in their gardens could receive an on-the-spot fine or be prosecuted. It is also classed as "controlled waste" in Britain under part 2 of the Environmental Protection Act 1990. This requires disposal at licensed landfill sites. Some home owners in the United Kingdom are unable to sell their homes if there is any evidence of knotweed on the property. The species is expensive to remove. According to the UK government, the cost of controlling knotweed had hit £1.25 billion in 2014. It cost £70 million to eradicate knotweed from 10 acres of the London 2012 Olympic Games velodrome and aquatic centre. Defra's Review of Non-native Species Policy states that a national eradication programme would be prohibitively expensive at £1.56 billion. The Centre for Ecology and Hydrology has been using citizen science to develop a system that gives a knotweed risk rating throughout Britain. The decision was taken on 9 March 2010 in the UK to release into the wild a Japanese psyllid insect, Aphalara itadori. Its diet is highly specific to Japanese knotweed and shows good potential for its control. Controlled release trials began in South Wales in 2016. In Scotland, the Wildlife and Natural Environment (Scotland) Act 2011 came into force in July 2012 that superseded the Wildlife and Countryside Act 1981. This act states that is an offence to spread intentionally or unintentionally Japanese knotweed (or other non-native invasive species). In Northern Ireland it has been recorded from Counties Down, Antrim and Londonderry. The earliest record is in 1872. In the United Kingdom, Japanese knotweed has received a lot of attention in the press as a result of very restrictive lending policies by banks and other mortgage companies. Several lenders have refused mortgage applications on the basis of the plant being discovered in the garden or neighbouring garden. The Royal Institution of Chartered Surveyors published a report in 2012 in response to lenders refusing to lend "despite [knotweed] being treatable and rarely causing severe damage to the property". There is a real lack of information and understanding of what Japanese knotweed is and the actual damage it can cause. Without actual advice and guidance, surveyors have been unsure of how to assess the risk of Japanese knotweed, which can result in inconsistent reporting of the plant in mortgage valuations. RICS hopes that this advice will provide the industry with the tools it needs to measure the risk effectively, and provide banks with the information they require to identify who and how much to lend to at a time when it is essential to keep the housing market moving. In response to this guidance, several lenders have relaxed their criteria in relation to discovery of the plant. As recently as 2012, the policy at the Woolwich (part of Barclays plc) was "if Japanese knotweed is found on or near the property then a case will be declined due to the invasive nature of the plant." Their criteria have since been relaxed to a category-based system depending on whether the plant is discovered on a neighbouring property (categories 1 and 2) or the property itself (categories 3 and 4) incorporating proximity to the property curtilage and the main buildings. Even in a worst-case scenario (category 4), where the plant is "within 7 metres of the main building, habitable spaces, conservatory and/or garage and any permanent outbuilding, either within the curtilage of the property or on neighbouring land; and/or is causing serious damage to permanent outbuildings, associated structures, drains, paths, boundary walls and fences" Woolwich lending criteria now specify that this property may be acceptable if "remedial treatment by a Property Care Association (PCA) registered firm has been satisfactorily completed. Treatment must be covered by a minimum 10-year insurance-backed guarantee, which is property specific and transferable to subsequent owners and any mortgagee in possession." Santander have relaxed their attitude in a similar fashion. Property Care Association chief executive Steve Hodgson, whose trade body has set up a task force to deal with the issue, said: "Japanese knotweed is not 'house cancer' and could be dealt with in the same way qualified contractors dealt with faulty wiring or damp." The weed can be found in 39 of the 50 United States. It is listed as an invasive weed in North Carolina, Massachusetts, Maine, New Hampshire, Ohio, Vermont, Virginia, West Virginia, New York, New Jersey, Alaska, Pennsylvania, Michigan, Oregon, Washington state, Wisconsin, Minnesota and Colorado. According to Gail Wallin, executive director of the Invasive Species Council of B.C., and co-chair of the Canadian Council on Invasive Species, by 2015 it was found in all provinces in Canada except Manitoba and Saskatchewan. In Vancouver the aggressive plant went under "four lanes of highway and have popped up on the other side." At Mission Point Park in Davis Bay, British Columbia municipal crews attempted to eradicate it by digging out the plant to a depth of about three metres with an excavator. It grew back twice as large the next year. To avoid an epidemic as in the United Kingdom, some provinces in Canada are pushing for relaxation of provincial limits on the use of herbicides close to waterways so knotweed can be aggressively managed with strong chemicals. In spite of its status as an invasive species it is still sometimes sold or swapped in Canada as an edible "false bamboo." Bohemian knotweed, a mutant hybrid— which is a cross between Japanese and giant knotweed that produces huge quantities of viable seeds —now accounts for about 80 per cent of knotweed infestations in British Columbia. Persicaria capitata for another plant species called Japanese knotweed. ^ a b c "Reynoutria japonica Houtt.". Plants of the World Online. Royal Botanic Gardens, Kew. Retrieved 2019-02-25. ^ English Names for Korean Native Plants (PDF). Pocheon: Korea National Arboretum. 2015. p. 358. ISBN 978-89-97450-98-5. Archived from the original (PDF) on 25 May 2017. Retrieved 4 January 2017 – via Korea Forest Service. ^ "How to deal with Japanese knotweed and other invasive plants". Sunday Express. 2014. ^ "Japanese Knotweed, Reynoutria japonica var. japonica". Invading Species Awareness Program, Ontario Ministry of Natural Resources and Forestry, Peterborough, Ontario Canada. 2012. Retrieved 2 August 2017. ^ "Japanese knotweed". Royal Horticultural Society. Retrieved 6 June 2014. ^ "itadori". Denshi Jisho — Online Japanese dictionary. Retrieved 9 March 2010. ^ "Pilot project of Bionic Knotweed Control in Wiesbaden, Germany". Newtritionink.de. Retrieved 2014-06-30. ^ Novelle, M. G; Wahl, D; Dieguez, C; Bernier, M; De Cabo, R (2015). "Resveratrol supplementation, where are we now and where should we go?". Ageing Research Reviews. 21: 1–15. doi:10.1016/j.arr.2015.01.002. PMC 5835393. PMID 25625901. ^ Chen, H; Tuck, T; Ji, X; Zhou, X; Kelly, G; Cuerrier, A; Zhang, J (2013). "Quality assessment of Japanese knotweed (Fallopia japonica) grown on Prince Edward Island as a source of resveratrol". Journal of Agricultural and Food Chemistry. 61 (26): 6383–92. doi:10.1021/jf4019239. PMID 23742076. ^ a b c d e f g "山菜関係資料 - 山菜文化産業懇話会報告書" [Wild vegetable related document - Wakami culture industry conference report]. Forestry Agency. 2004. ^ "イタドリ" [Local cuisine and traditional ingredients > Itadori]. 讃岐の食(Sanuki eating). 2001. ^ "Article on the costs of Japanese Knotweed". Gardenroots.co.uk. Archived from the original on 2012-09-04. Retrieved 2014-06-30. ^ "Plants That Look Similar To Japanese Knotweed: Plants Mistaken For Knotweed". Phlorum.com. Retrieved 26 June 2017. ^ "How To Identify Japanese Knotweed, Knotweed Identification Card & Pictures". Phlorum.com. Retrieved 26 June 2017. ^ "Fallopia japonica (Japanese knotweed)". Invasive Species Compendium. 4 January 2017. ^ "THE REGIONAL BOARD OF FREIBURG FIGHTS JAPANESE KNOTWEED, AN INVASIVE NEOPHYTE, WITH HOT STEAM". Soil Steaming and Steam Boiler Blog. 3 October 2009. ^ "Notes on Biological control and Japanese knotweed". Gardenroots.co.uk. Archived from the original on 2012-08-03. Retrieved 2014-06-30. ^ "Testing the psyllid: first field studies for biological control of knotweed United Kingdom". CABI. Retrieved 2014-06-30. ^ "On CABI Web site, Japanese Knotweed Alliance: Japanese knotweed is one of the most high profile and damaging invasive weeds in Europe and North America". Cabi.org. Retrieved 2014-06-30. ^ "The Knotweed Code of Practice" (PDF). gov.uk. Environment Agency. ^ McLean, Denise (July 2013). "Haida Gwaii Knotweed Herbicide Treatment" (PDF). ^ "Asiatic knotweed". Biosecurity New Zealand. 14 January 2010. Retrieved 29 December 2012. ^ Sam Meadows (14 August 2017). "'Japanese knotweed halved the value of my home, but Network Rail won't pay'". The Daily Telegraph. Retrieved 20 August 2017. ^ a b c Riley-Smith, Ben (25 October 2014). "Homeowners who fail to control Japanese knotweed face criminal prosecution under new anti-social behaviour laws". The Telegraph. Retrieved 26 July 2017. ^ "Review of non-native species policy" (PDF). Department for Environment, Food and Rural Affairs. 2003. Retrieved 14 July 2013. ^ Pescott, Oliver. "Mapping knotweed using citizen science". Centre for Ecology and Hydrology. Retrieved 20 September 2017. ^ Morelle, Rebecca (9 March 2010). "Insect that fights Japanese knotweed to be released". BBC News. Retrieved 30 June 2014. ^ Richard H. Shaw, Sarah Bryner and Rob Tanner. "The life history and host range of the Japanese knotweed psyllid, Aphalara itadori Shinji: Potentially the first classical biological weed control agent for the European Union". UK Biological Control. Volume 49, Issue 2, May 2009, Pages 105-113. ^ "CABI Natural control of Japanese knotweed". Cabi.org. Retrieved 2014-06-30. ^ "Japanese knotweed tackled with insects in secret south Wales spots". BBC News. 23 July 2016. Retrieved 23 July 2016. ^ Leah Milner (2013-07-08). "Japanese knotweed uproots home sales". The Times. Retrieved 2014-06-30. ^ a b 5 July 2013 (2013-07-05). "RICS targets the root of Japanese Knotweed risk to property". Rics.org. Archived from the original on 2014-03-07. Retrieved 2014-06-30. ^ a b "Woolwich Lending Criteria". ^ "Japanese knotweed, the scourge that could sink your house sale". The Guardian. 2014-09-08. ^ "Brokers demand action on Japanese knotweed". Mortgagesolutions.co.uk. 2013-08-14. Retrieved 2014-06-30. ^ "Fallopia japonica". USDA Plants Database. ^ "USDA weed profile for Japanese knotweed". National Invasive Species Information Center. Retrieved 2014-06-30. Wikimedia Commons has media related to Reynoutria japonica. Species Profile- Japanese knotweed (Fallopia japonica), National Invasive Species Information Center, United States National Agricultural Library. Lists general information and resources for Japanese knotweed.